In 2010, someone and I went to the Pawnee Grassland on the high plains of northeast Colorado. We both loved the isolation, the solitude, the wide open spaces, and the stark and desolate terrain that was beautiful. And, above all else, the night sky that was brilliant with its display of stars. It was a different type of wildness than the desert or the mountains. For the weekend just prior to my birthday, I wanted to return to the area and explore a bit more. I wanted to again experience the desolate beauty that I frankly fell in love with five years ago. But, when I returned, I was saddened. In the five years since I’ve been there, this area has again seen one of the booms that alters and changes the land. The prairie always endures, and eventually recovers, but the changes it faces seems to scar the landscape. The energy boom is perhaps the 21st century version of the fur trade boom from two-hundred years earlier. (The route of which went through this area as the “Trappers Trail”..from Ft. Laramie in Wyoming, down to the four forts along the Platte and to Bent’s Fort and beyond) : A quick and lucrative way to earn money but perhaps at the cost of the environment in which it is done. The beaver nearly became extinct. But recovered. Perhaps the prairie will recover as well. The desolate landscape is now marked with many gas and oil pads…. And it is not just the oil and gas boom, either. Windmills have propagated a lot in the past five years as well. The world class birding has declined, the formerly desolate dirt roads have a constant stream of energy truck traffic and the landscape does not seem to be stark so much as used. And, perhaps most sad of all ,the night sky is no longer this scene of wonder. The night landscape is a mixture flame and artificial light and not the stars above. Unfortunately, I think I’ve seen the answer. With a $30 million dollar deal signed this past week by the BLM, and momentum to open up our wild lands for even more development, I suspect this area will lose more of the wildness. Of course, I did drive my car to this area, use clothing and gear made from petroleum products and I am one of the many people consuming resources in a rapidly growing area. Perhaps I am being hypocritical. But I do know once a wild area is gone, it is gone. The land will survive, but the scars will take a long time to to heal. And, unlike the ranchers and farmers of this area who use the land, I suspect the newer interests of the energy boom do not want to leave a sustainable legacy for future generations. 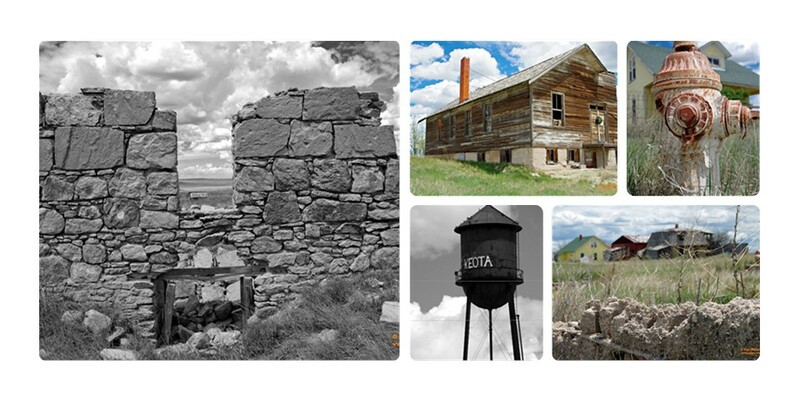 When it is no longer profitable to use the land, the remnants will be left behind much like the mining ruins found to the west in the Colorado Rockies. This post was perhaps a bit more melancholy than I intended. There are increasingly few wild areas left. And to see another one become less wild in such a short period of time somehow creates a heavy feeling in the soul. Which is perhaps a good segue to one of the purposes of visiting this area:seeing the Dust Bowl-era town of Keota. Another cautionary tale that fit the landscape we were driving through. Since seeing Ken Burns’ Dust Bowl documentary, I’ve been wanting to revisit this town. Keota is currently a sad place that has echoes of past lives and hopes. Even as we were looking upon the ruins of one dream, we heard and saw the constant stream of traffic from oil and gas trucks around us. In a thoughtful mood, we made our way to the Pawnee Buttes. If the area around the buttes has changed, at least the buttes themselves and the immediate protected lands still have the scenic wonder about them that I remember. After our hike, we made a loop and went to the much improved trail head. Picnic tables, lots of stone work, information (propaganda) kiosks and a few more amenities are now present versus the lonely place where we once sat on the tailgate of my old pickup and took in the landscape. We drove up from the buttes to a rutted dirt road. The same campsite we had five years ago was available! The same view was still had. The moving storm and the sun breaking out from the clouds gave us a sight that made me forget the melancholy I was experiencing earlier. Alas, I woke up that night. Gazing out on the landscape, I saw enough light for a good sized town. The night sky I remember had vanished. I woke up again the following morning with another touch of melancholy. After our morning coffee, we made our way less than twenty miles north. 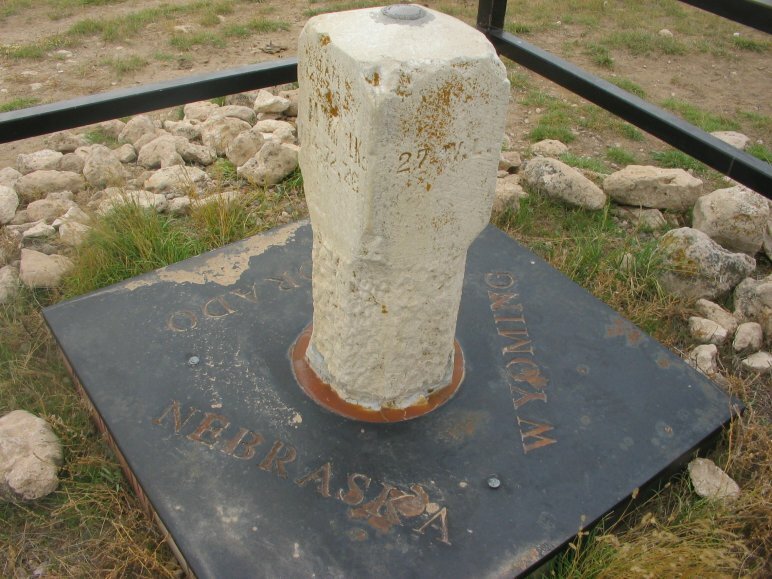 Panorama Point, the highest point in Nebraska, was almost directly on the Colorado and Wyoming borders. Too close to not see! We drove on the private road, paid our small fee, and enjoyed the view in front of us. The high point is on a bison ranch. The large herd, with the expanse of the high plains in front of us, created a memorable scene. To the west, the high point lived up to its name. The rolling hills of the high plains stretched before us. The borders of Wyoming and Colorado was less than a mile away. On the Colorado side of the ranch. Behind two very stout fences! From Colorado Guy. We were only about .5 miles away. So it goes! After this little jaunt, we explored the less developed western side of the Pawnee Grasslands. Quiet and rolling lands with the Rockies to the west. Rather than the interstate, we took the back road of US 85 along the Platte (aka the Centennial Highway) and further explored the area made famous by Michener. Mrs Mags and I had seen the sites of three of the forts previously so it was a fitting way to connect the history all together. We soon headed back towards our home. We passed the new prairie development housing and energy boom towns of Erie, Dacono, Firestone and surrounding areas. We saw the old history of the fur trade, saw the towns leftover from the railroad and dry farming boom and now we see the changes made by the current energy boom. And we also saw the future. A growing area, more development and what wild places are left vanishing or getting used more to the point of un-sustainability. I am part of the problem…but perhaps there is a way to be part of the solution as well. What that solution may be is something to ponder. In the mean time, I will enjoy the wild spaces as long as they remain. Oh, this bums me out so much! My husband and I camped at Pawnee many years ago (16-17-18?). We just unrolled our sleeping bags on the grass and lay under the stars–not a building, not a powerline, not a fence post for as far as the eyes could see in every direction. On the hike to the buttes we sawed a horned lizard and rattle snake (dead). Tons of wildflowers. It was so beautiful there. How sad and short-sighted to mar the last bits of wild prairie left. “I hope that at somepoint in time people won’t look back at our images and think “where was that? It’s just a field of oil wells. I encourage you and your readers to share your thoughts with the FS. My wife and I noticed the amount of shooters as well. The birding was noticeably less, too. Thanks for the link. Thanks! Loved all the interesting links in your write up.